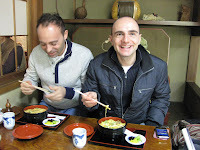 Kyoto private Guide: Enjoy your meal! Last month, I showed around Italian speaking people. At the lunch time, when lunch was served and when we were about to eat, they said, "Enjoy your meal". And last week, a new member of our service, Ririko and I showed around the guys from Italy. At the lunch time, I heard the same words. "Enjoy your meal". The words sounded nice to me! In Japan, we usually say "ITADAKIMASU". The direct translation is "I am going to have the meal " in a polite way. And we also say "GOCHISOUSAMA (DESHITA)" whose literal meaning is "It was a good meal" or "Thank you for the meal" when we finish a meal. We, Japanese tend to show gratitude to a person who makes a meal. On the other hand, "Enjoy your meal" tells us that we should enjoy our meal! The expression related to the meal interests me a lot. So, Let's enjoy our meal and express thanks to a person who makes our meal!